Auburn Gear @ Southern Gear Company, Inc.
From over the road daily driving to muddy trails and back roads, Auburn Gear's high bias Pro Series and High Performance Series limited-slip differentials outperform standard OEM differentials hands down. They deliver more traction and faster engagement for controlled power transfer and lightning-fast reaction to changing load conditions. No matter what your application - performance or passenger cars, light duty trucks, vans, sport utility vehicles, off road, or recreational vehicles - the Auburn Gear limited-slip differential is engineered to provide smooth torque-sensing operation with bias ratios to meet your performance needs. This superior performance is achieved through an innovative cone clutch design which transfers more power to the high-traction wheel for quick acceleration and tight cornering. 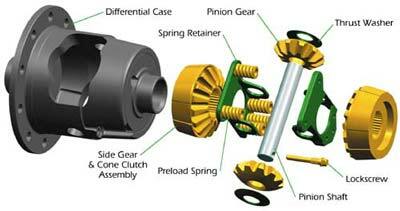 Auburn Gear has a full range of differentials for Chrysler, Ford, GM and Toyota vehicles. All are also compatible with all ABS and electronic controls.